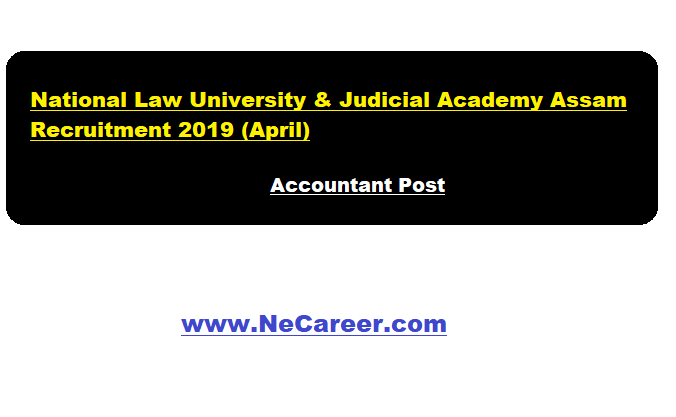 National Law University & Judicial Academy Assam Recruitment 2019 April - Accountant Post:- Welcome to North East India's No. 1 Job Portal NeCareer.com . National Law University & Judicial Academy Assam has issued a non teaching job notification in April 2019. According to the NLUJAA Assam recruitment, applications are invited in both hard copy and soft copy for recruitment of Accountant post in contractual basis in the centre for child rights. Get more details about this job in Assam in below section. Eligibility : Candidates must be Graduate.Applicants must be proficient in the use of computer. Mode of Contract : Appointment of the post of Accountant will be made on contractual basis initially for a period of One-year subject to extension based on satisfactory performance. Eligible and Interested candidate may apply with prescribed application form. Applicants must fill the application form in prescribed format available in the University website. Applicants must send their application form along with a Letter of Intent. Scanned and signed copy of the Application Form (without testimonials) should be mailed to ccr@nluassam.ac.in in PDF format. Subject line of the mail should be “Application for the post of Accountant”. 1) Hard copy of the Application Form without testimonials will be summarily rejected. 2) The Application Form in both soft and hard copy must reach on or before 2nd May, 2019.